If you’ve got poker straight locks and want to make them wavy, there is a plethora of options and techniques you can use. A curl isn’t just a curl, after all. 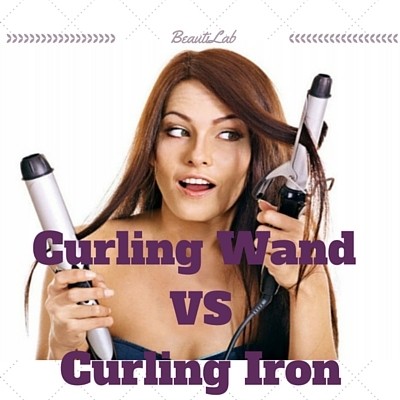 This is a curling wand vs curling iron competition. There are spirals, loose summery waves, big glamorous Hollywood-style waves, you name it. And, of course, there are so many different tools and sizes to help you achieve each of these looks. Some newer gadgets like Wavers, self-rotating curling irons, and hot air brushes have hit the market to provide a more specialized look or styling technique. On this site, we’ve got them all covered for you! 1 Finding the Best tool! Think about your hair texture! If you already have curly or wavy hair and need an extra boost, choose something with varied heat settings because that super hot setting on many irons will not always be of use to you. Likewise, if you want to curl your fine hair, you’ll need to protect it from daily high heat, so a variable temperature and ceramic material are important. If you have thick or coarse hair, the high heat of something like titanium or a titanium-ceramic blend might be a necessity but always look for the best of technologies to prevent frizz and breakage because damage can so easily show. For ladies with short hair, a smaller plate or barrel size will suffice because you don’t have enough space to cover, while ladies with longer hair require a more substantial iron to handle the quantity in their locks. While they look the same because of their shape, you might think they are nearly identical or that they achieve the same results. And while, yes, you are partially right (hair does come out curly, after all), it really comes down to personal preference. Here are a few ways that curling wands and curling irons differ. You will sometimes see a curling wand referred to as a clipless curling iron. That is because it doesn’t have a separate piece hinged to the top to hold your hair in place. The lack of clip means you can more quickly wrap each section of hair and let it fall before moving on to the next one. Your own hands take the place of the clip, and those extra couple of seconds you save between each strand really add up. While it’s not impossible to achieve with a curling iron, a curling wand offers many different types of curls while you are actually in the process of wrapping your hair. We’ve mentioned that if you continue the spiral of your hair in the same direction with a continuous wrap around the barrel of a wand that the result will be more uniform curls. These can then be brushed for a more actress-style wave. In contrast to this, if you both wind the hair around the barrel and twist it simultaneously, you will add volume and a loose “beachy” style to your hair with this very same wand. It can be done with a traditional curling iron, though not as easily because, don’t forget, you have that clip holding the hair in place. Many curling irons naturally have a piece on the underside of the clip that looks like a kickstand. This helps it to sit upright in between sections of hair. And when you are finished styling so that the heat never touches your countertop. Somehow, many curling wands do not have this feature. Some have an immovable piece meant for this same purpose. And many will also include a heat resistant mat on which to set the wand instead. Make sure to look for one of these two features if choosing a wand over and iron. Not always, but sometimes you will see curling wands that are tapered. This means they have a wide base and a narrow tip. There is some debate as to whether this helps keep the hair in place as you curl or not. Some people think it makes it more difficult while others swear by it as the easiest way to style. One thing is for sure – it creates a wider curl at the base and a narrower one at the tip, therefore following the natural flow of your hair. Without the clip of a curling iron to help hold hair in place, when using a wand, both of your hands need to be equally involved. One holds, one wraps. Because your fingertips will come in awfully close contact to the source of heat. A glove is recommended, especially for first timers. But what about hot air brushes, you ask? We knew you were thinking that too! This less common but definitely solid option combines the functions of a blow dryer and curling iron. It both blows hot air and curls the strands at the same time. The big plus side is that this is a timesaving technique by putting two separate processes together. The only downside is that with air blowing through the brush, there will not be heat pressed on your cuticles from both sides. So you will not sweep it through your hair in one pass, but rather hold it as it dries and move it slowly through each time. While it takes more patience with each section, the end result does eat up less time. The bottom line is truly knowing your own hair. Is time the most important factor to you? Do you want a truly professional look that only comes from high heat? Do you need to do everything you can to protect already damaged hair? Or, most importantly, how do these needs change on a day-to-day basis? If you haven’t already, you might want to consider buying one daily styler while you keep a separate one for weekend or important events.